Even as the sale of forms picked up on the second day of nursery admission at city schools today, parents juggled between multiple schools to secure maximum number of forms for their tiny tots. Dissatisfied with the division of property, a 22-year-old boy, Gaurav, has been arrested by the Delhi police, Central district, for allegedly killing his cousins in Ranjit Nagar yesterday. The Supreme Court today restrained the authorities from resuming the ceiling drive against unauthorised constructions or regularising such structures in Delhi until further orders. Travellers of the Delhi Transport Corporation (DTC) buses may have to shell out more as fares for both AC and non-AC buses may be hiked by 65 per cent, a government source said. The Central Board of Secondary Education (CBSE) today released its datesheet for both the tenth and twelfth classes for the session 2011-2012. The third Delhi Haat of the city, which is proposed to come up at Janakpuri by August 2013, will be the biggest haat of the national capital as the Delhi Development Authority (DDA) has provided 10 acres for the project. The land for the haat has been allotted to Delhi Tourism. Air-conditioners, CCTV cameras, new furniture and amenities -- Tis Hazari, the oldest district court complex of Delhi, is in for a much-needed facelift, with the government giving its nod to a proposal mooted two years ago. Strangely enough, the post of divisional forest officer (DFO) is being held by the director (Horticulture) of Noida Authority. Green activists are up in arms against this dual charge, saying that it is illegal as the authority has to cut trees for development projects and for which it has to take permission from the district forest department. In this case, permission will be given by the authority officer as he is holding dual charge. A former enforcement directorate official and his wife, found having a hotel in Dalhousie and other assets nearly thrice their legal income, have been sentenced to three years in jail by a Delhi court. With the arrest of five men a few days ago, the Delhi police today claimed to have busted an inter-state gang of vehicle thieves. Singhu Border to Mukarba Chowk on National Highway-1 remains the biggest deathtrap in the Capital. For the astro enthusiasts, the New Year will start with fireworks. A meteor shower will peak tomorrow night, appearing as bright streaks of light zipping across the sky. The weather in the city today remained relatively cold for Delhiites as the minimum temperature dropped to 7.9 degree Celsius from yesterday's 11.6 degrees, though foggy conditions prevailed in the morning. A Canadian man, found in possession of narcotic substances, has been sentenced to eight months in jail by a Delhi court. The Tihar Jail authorities have decided to take the help of dogs to detect the presence of narcotics on the jail premises. The Delhi police today claimed to have arrested a Nigerian national with cocaine worth Rs 1.75 crore. The suspect was identified as Paul Chinedu Ugwor. The Delhi High Court on Tuesday dismissed a plea of DLF Ltd., challenging an order of market regulator SEBI to probe accusations by a Delhi-based businessman that he was duped of Rs 34 crore by the realty major and its alleged associate firm Sudipti Estates. A Rs 2-lakh cost was also imposed on DLF. Prioritising their choices, parents today said with the rush to get worse over the next few days, it was important for them to get admission forms of all schools they had zeroed down upon. "It is a working day for me and my husband, but we took some time off from work and rushed to different schools to fetch the forms. I went to Modern School Barakhamba and St Fransis while my husband went to Martyr De and Mother International. We have four more schools to cover tomorrow," said Shobhna Kaushik, a Vasant Kunj resident. Bubbly Gupta, who was at DPS Mathura Road to collect form for her niece today, said, "The queue starts forming as early as 7.30 in the morning since most parents have to rush to work after that. I have come all the way from Ghaziabad to south Delhi to collect some forms for my niece as her parents are out of town currently. While some schools do offer online forms, others have a counter collection procedure. It was biting cold when I reached here at 8.30 in the morning, the time when the sale of form starts. But by then, the queue had already reached the gate of the school." Parents complained that despite the promises made about easing the admission process, the system was still tiresome and frantic. "One needs at least three to four days to collect forms from every school of your choice. In some cases, even more. The minimum time a parent will have to spend at every school can be anywhere between three to four hours. Several schools don't even have provisions for seating or refreshments. It's a tough job," said Vindhya Roy, a CR Park resident. The prospectuses of various schools cost between Rs 25 and Rs 150. The last dates for the submission of forms fixed by the schools are between January 9 and 11. "There is hardly any time, as one has to procure forms from different schools, go back home and fill them and then again run around for submission. It's a very strict schedule. Every school has different criteria and a different deadline and it is very difficult to keep a track," said Apoorv Mittal, a parent at Bal Bharti School, Lodhi Road. The case was reported on January 2 when Ajay Arora, a resident of Ranjit Nagar, found his two children murdered in his house. The deceased Vishal and Shivani were badly injured and lying in a pool of blood while the house was ransacked, said DC Srivastva, Additional Commissioner of Police, Central Delhi. Ajay Arora's elder brother Sudhir Kumar was staying on the second floor of the same house. "It was found that Sudhir Kumar along with his family members had gone to Himachal Pradesh on a religious trip. 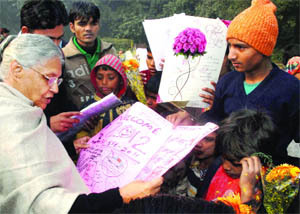 Only his younger son Gaurav had stayed back in Delhi," said Srivastva. "Efforts were made to contact Gaurav on his mobile phone. However, it was found switched off. In the meantime, Sudhir Kumar revealed that his son Gaurav was not satisfied with the division of parental property between him and his brother Ajay Arora and always sulked about it," he said. During his interrogation, Gaurav revealed that he was dissatisfied with the property division between his father and uncle as the latter had got a larger share. Earlier, in order to take revenge for a perceived wrong, he had purchased a countrymade pistol. On the fateful day, he entered his uncle's house and one after the other, shot dead his cousins Vishal and Shivani and later took away some jewellery from the house and ransacked it in order to give it a look of robbery," he said. A Bench comprising Justices GS Singh and Swatanter Kumar passed the order while hearing petitions challenging the validity of the Master Plan for Delhi (MPD) 2021. The petitions have been filed by individuals, civil society members and NGOs. The Bench directed the Delhi Development Authority, Municipal Corporation of Delhi and the New Delhi Municipal Council to prevent further encroachments on government or public land in the areas where the ceiling drive had been launched by the SC-appointed monitoring committee. The monitoring committee has submitted its report on the ceiling drive against commercial activities in residential areas and this would be examined by the Bench before the next hearing in March. The Bench had stayed the ceiling operation on November 29, 2011, pending receipt of the report from the monitoring committee. The DTC had sent a proposal to the government for revising the fares, the source said. The commuters may have to pay a maximum of Rs 25 instead of Rs 15 on the low-floor non-AC buses if the proposal gets the green signal. Currently, there are three fare slabs for the non-AC low floor buses-Rs 5, Rs10 and Rs15-- and as per the proposal, two slabs of Rs 20 and Rs 25 will be added. The exams for both the classes will begin on March 1. The Class Xth students will have their mathematics exam on March 2. Students will get enough time to prepare for the first exam. While the IT foundation exam is scheduled for March 10, the home science exam is on March 12 with just a one-day break. Even the science paper has been placed skillfully this time so as to give the students some rest. The science exam will be conducted on March 20, with the datesheet giving a gap of over three days for the paper. Most language papers, including Hindi, English and Sanskrit are either back to back or with just a day break. The last exam of social sciences will be conducted on March 26. The exams will be conducted both for the Class X and XII in the first half of the day, with the exam beginning at 10.30 am sharp on all days. For Class XII as well, the exams begin on March 1 with the first exam being English. On March 3, with just a day gap, students will appear for political science paper. For the science stream, students will have physics paper on March 5. Commerce students will face business studies on March 6. The datesheet for Class XII will end on April 13 with the last paper on psychology. "Covering an area of 10 acres, it will be the biggest Delhi Haat in the city," said a senior Delhi government official. The new haat will be designed keeping in view all the requirements of the craftsmen and visitors. It will have a bigger parking space. The expenditure and finance committee of the Delhi government has sanctioned Rs 81.44 crore for the construction of the haat, which will be the most modern and green Dilli Haat. Apart from showcasing the art, craft and culture of the country, the new haat will have many more things to offer to the visitors. It will have about 130 craft shops, an exposition hall, auditorium, amphitheatre, art gallery, information centre, a food court, coffee shops etc. The plan also envisages landscaping of the plot for the visitors' convenience. The haat will have full power backup facility and an electronic surveillance system for security. The first Dilli Haat was established at INA in New Delhi in 1994. Based on its popularity, Delhi Tourism established a second one at Pitampura in 2008. The Janakpuri Haat will not only be the biggest, but will introduce a new concept of 'Haat Beat-Dilli Haat' with a music centre. There will be music towers that will host an educational and resource centre, a performance space and a museum. A fourth Dilli Haat has been planned in east Delhi. The project has been put on hold for over two years. The renovation of the complex is set to be completed by March 2012, according to Delhi Bar Association president Rajiv Khosla. Over 10,000 litigants daily visit the court complex, spread over around 26.4 acres. It houses five buildings, including the main court building. It has 125 courts and 10 mediation cells, apart from a consumer and sub-divisional magistrate court. The nod for the project came after a meeting held on Saturday among the representatives of the Delhi government, administrative department of the district court and the bar association. "The government has approved the proposal for the renovation of Tis Hazari courts in a meeting held on Saturday and around 125 court rooms will be equipped with air-conditioners by March 2012," said Khosla. The CCTV cameras will keep an eye on anti-social elements, trouble-makers and terrorists. "Despite being one of Asia's biggest courts complex, Tis Hazari has not undergone much repair or renovation since its inception in 1958," said Khosla. Damaged walls and peeling plaster, non-functioning lifts, defunct water coolers and damaged seats for litigants and witnesses outside court rooms would all be repaired, he said. "A proposal for building multi-storey parking lots was also made by lawyers before the decision makers," he said. The news on the proposed facelift has brought smiles to the faces of thousands of litigants as well as lawyers. Public prosecutor Mohammed Shakeel said the renovation would improve the efficiency in the court complex. "Most of the witnesses come from far-away places during summer. The cool court rooms will provide them some relief," said Shakeel. Rakesh Bishnoi, a 35-year-old litigant, echoed the sentiment. "As compared to other courts, the Tis Hazari complex isn't well equipped. I am sure that the refurbishing job will give a new lease of life to the complex," he said. Sunil Pandey, chief conservator of forests, Meerut, said, "One divisional forest officer is required in each district. Where there are more forests, more than one DFO can be posted. In Gautam Budhh Nagar, there is just one post of DFO." When asked whether the post of authority office and that of divisional forest officer can be held by a single person, Pandey refused to comment, but added, "The posting has been done by the state government." B Prabhakar from the Indian Forest Service came to Noida Authority on deputation from the forest department a few years ago and is director (Horticulture) in Noida. Around six months ago, the then Gautam Budhh Nagar divisional forest officer Sunil Dubey was transferred. Instead of giving the additional charge to the neighbouring district's DFO, it was given to Prabhakar. At present, he has been holding the dual charge of DFO and Noida's director (Horticulture). Sanjay Singh Bhatti, president, Gautam Budhh Nagar Bar Association, said, "Technically, one should not hold both the posts. As an authority employee, his decisions as DFO may be biased." On the condition of anonymity, some officials said the DFO was transferred as he was creating obstacles in cutting of trees in the city centre area at sector 32. The dual charge has been given to facilitate the smooth approval. Green activists say that though this will speed up development as the permission for cutting the trees will be granted easily, the environment aspect will take a backseat. Special CBI Judge PS Teji sentenced 67-year-old former ED assistant director DL Vaid to three years in jail for amassing assets beyond his known sources of income between year 1987 and 1995, in violation of the Prevention of Corruption Act. His wife Kamlesh Vaid, 63, was also awarded similar punishment for aiding and abetting her public servant husband in his criminal misconduct. A fine of Rs 25,000 each was also imposed on them. As per the CBI, Vaid joined ED as assistant enforcement officer in 1971 and was promoted as enforcement officer in 1976 and then again as chief enforcement officer in June 1987. In December 1994, the CBI said, he was promoted as assistant director and remained posted in Delhi Zone up to May 1995 and that he acquired most of his properties from 1987 to 1995 in his name and in the name of his family members and mixed up his illegal money with the income of his wife. Vaid acquired immovable and movable assets in the names of his wife, son and daughter, said the CBI, adding the ill-gotten money was used to start hotel business at Dalhousie, Himachal Pradesh, in Kamlesh's name. They also had various bank accounts with huge balances, besides huge investments and shares and paid hefty insurance premiums, the agency added. The CBI submitted that Vaid and his wife acquired disproportionate assets to the extent of 166.64 per cent to their known sources of income from 1987 to 1995. It said on totaling their assets acquired during the given period, the value came to be Rs 75.80 lakh, whereas the income from all sources stood at Rs 28.42 lakh. "The accused were given ample opportunity to explain the source of their income, but they failed to give any reasonable explanation and account for the assets acquired by them," the court said. 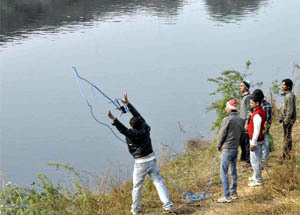 The gang is believed to be involved in over 500 cases of vehicle theft in Delhi alone. Ninty cases have been worked out so far with the arrests. A total of 10 stolen vehicles, including a Tata Safari car, two Maruti Swift cars, three Santro cars, two Alto cars, one WagonR car and one motorcycle, have been recovered. The gang had disposed most of these stolen vehicles in northeastern states and the NCR. Eighty-four stolen vehicles have been traced to Mizoram. A large number of forged documents like RCs, driving licences and letter heads used for transporting stolen vehicles have also been recovered from the accused. The accused have been identified as Kharka Bahadur Rana, Mohammed Arkan, Mohammed Arman, Shekhar and Muzzaffar. The police said the gang was so well organised that if any member would get arrested, others would go underground. The gang members, most of whom are previous criminals, were well aware about the working style of the police. They frequently changed their contact numbers and used SIM cards of other states to avoid getting caught. The leader of the gang is Kharka Bahadur Rana, who used to receive stolen vehicles in northeastern states. He is a resident of Siliguri, West Bengal. The team first nabbed Mohammed Arman on September 26 last year. He is an expert vehicle thief involved and arrested in more than 10 cases of vehicle theft. He would trail the target vehicles on motorcycles. His interrogation lead to the identification of other gang members. For Rana's arrest, a team was sent to Siliguri. The team camped in Siliguri and Guwahati for about 15 days and studied the modus operandi of the gang. He was finally arrested on December 15 along with other gang members. The accused were then brought to Delhi on transit remand and produced in the court. Subsequently, their police custody was obtained. They were then taken to Mizoram for apprehending their accomplices and identifying stolen vehicles. The records of various transport authorities in Mizoram were obtained for verification and so far, 84 vehicles stolen from Delhi have been found to have registered there. The verification process is still on and many more vehicles are likely to be traced. Though the Delhi traffic police has considered a slew of corrective measures on the 22-km stretch, the number of fatal accidents increased to 112 during the year 2011 from 70 during the previous year, an increase of almost 60 per cent. "While the number of fatal accidents has fallen elsewhere in the city, this stretch remained a headache for the Delhi traffic police. The total number of fatal accidents has gone down to 2,066 during 2011 from 2,153 during the previous year 2010," said Satyendra Garg, Joint Commissioner of Police, speaking at the Road Safety Week Seminar, 'Road Safety-Action plan 2012', organized by the International Road Federation (IRF). To ensure the safety of pedestrians, the Delhi traffic police has planned several steps like placing rumble strips, constructing foot overbridges and underpasses, notice boards indicating the speed limit (60 kmph) on the roads. The police also plans to set up artificial barriers in the form of drums that restrict the 15-metre-wide carriageway so that vehicles have to compulsorily slow down, said Garg. During 2011, he said that the traffic police issued eight lakh challans for jumping red lights besides 2,906 jail terms for drunken driving. "The strict measures also resulted in the Capital having New Year celebrations without fatalities last week. But several steps need to be taken by the government to further reduce fatal accidents in the Capital which include amendment of Motor Vehicle Act, stricter norms for issuing driving licence and fitness certificate for commercial vehicles," said Garg. He said that the non-revision of penalties for various traffic violations is one of the major reasons for accidents in Delhi. "The fines need to be increased many times while driving licence should not be issued so easily. The process of vehicle fitness certification should also be made strict as most of the commercial vehicles plying in Delhi are poorly maintained and are not roadworthy," said the Joint Commissioner of Police. The International Meteor Organisation (IMO) expects maximum of 120 meteors per hour, Planetary Society of India general secretary N Sri Raghunandan Kumar said today. The number of meteors could vary from 60 to 200 per hour as the Quadrantids meteor shower peaks tomorrow. The maximum temperature was recorded at 20.6 degree Celsius. The weathermen have predicted mainly clear sky for tomorrow with fog in the morning. However, dense fog disrupted several flight and train services yesterday. Low visibility at the IGI airport in the morning affected flight operations with nine l flights diverted, eight cancelled and around 19 delayed. Joseph Emil Sabbagh was found to possess charas and heroin on board an Air India flight to London from Mumbai at New Delhi Indira Gandhi International Airport, where he had to be off-loaded after he fell sick. Special judge (NDPS) Ravinder Kaur also imposed a fine of Rs 50,000 on Sabbagh. Sabbagh had taken the flight from Mumbai on March 19 last year. He fell sick and had to be de-boarded at the New Delhi IGIA airport for a medical check-up and then was taken to Medanta Medical Centre at the departure check-in area. As he was being brought back to the security hold area after his medical check-up to be put on his onward flight to London, it was detected that he had four drug pouches, containing 95 gm charas and 90 gm heroin, tucked in his socks. The need for deploying canines was felt after some prisoners managed to smuggle in contraband into the jail despite installation of gadgets. The duty has been assigned to a team of Labrador and Stately Alsatians who are being trained by the Indo-Tibetan Border Police. "The Labradors and Stately Alsatians of the ITBP that are trained at its National Dog Training Centre in Bhanu will be able to trace drugs smuggled by notorious inmates in body cavities and which remain undetected by normal detectors," deputy inspector general of Tihar Prisons RN Sharma said. "They are trained to be alert on more than one kind of drug. These trained dogs can locate drugs concealed in body cavities too," he said. Tihar Jail, Asia's largest prison, is grappling with the problem of smuggling of different types of drugs and narcotics into the prison. "There have been incidences when prisoner or their visitors have carried in drugs which were not detected. In such cases, these specially trained dogs will work wonders. They can sniff and tell," Sharma said. Ugwor was arrested from Shivaji Marg in Janakpuri where he had come to deliver cocaine to a contact. Ugwor resided at Nawada in Uttam Nagar. Paul disclosed that he came to Mumbai in 2008 on a multiple visa. He used to export textiles from India to Nigeria. Then he met a fellow Nigerian, Dabel Chukwu, who used to supply cocaine to pubs and bars in Mumbai, and joined him. Ugwor shifted to Delhi in 2010 and started supplying cocaine to high-profile clients and parties in the NCR. It is one of the biggest recoveries of cocaine in the recent past, the police said. Justice Vipin Sanghi said, "The board is the sole authority created by law to deal with complex issues which arise in the management and supervision of the securities markets. Any such restrictions, artificially introduced, would denude the board of its powers and hamper its functioning."